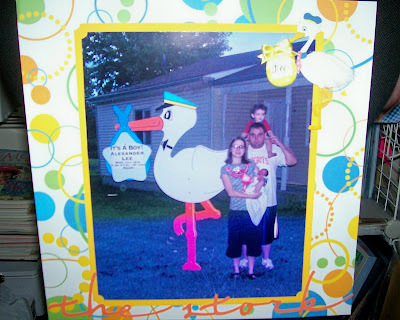 Confessions of a 20-something Scrapbooking Mother: "The Stork"
My very best friend ordered us a stork for the first week Alex was home. Isn't he cute?! Unfortunately Alex didn't come home when he was supposed to, and we were only able to take one picture all together, the night before they took the cute guy down. I wish we had gotten a better photo, because it was getting dark and its just not a good pic! But I guess it will have to do. :) So here is the layout I made. The paper is Pebbles Inc. I love the colors! I used OA for my title (although I need to do something extra to it because its kind of blending in a bit). My little stork is Jolees, and I ticket punched my pic and mat. Having a relaxing day at home today. YAY! Have been trying to redo the boys rooms, so I'm going to work on that and clean the house a little. Hopefully will spend some time in my scrap room later if I can get Aaron to nap when Alex does! :) We'll see! Thanks for stopping by! Oh, this is so cute! We had storks for both of our girls too, and I still have the pink bags from the signs in the basement with their names, date of birth, and weights on it. Did you get to keep the star from the stork? This page is awesome. I love the title (it will stand out more if you shadow it), and that Jolee's is PERFECT! Totally cute! Those storks are too cute! Your page turned out precious.